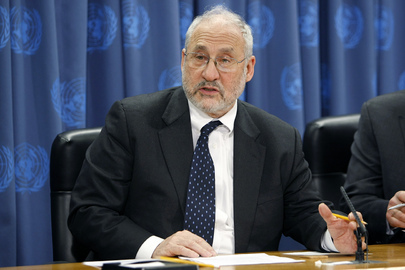 UNITED NATIONS, March 27 -- In the run-up to the G20 meeting in London, economist Joseph Stiglitz spoke at the UN against irrational incentives in the financial services field -- read, the AIG and Citigroup bonus -- and in favor of the idea of a Financial Products Safety Commission, like the agencies conducting pre-release reviews of medicines and even electronics such as toasters. Stiglitz noted that banks rush to exploit lower income and minority Americans with subprime loans has now damaged economies all over the world. And, we note, rather than accountability, those who engaged in predatory lending and securitizing have received bailouts. Whether any of this will be meaningfully addressed by the G20 is not known. The UN's main pitch at the G20 is, with some vagueness and confusion, a request for $1 trillion. Secretary-General Ban Ki-moon made the request in a March 20 letter to G20 participants, then found himself unable to repeat the number when standing on camera next to UK Prime Minister Gordon Brown. The next day, however, when Inner City Press asked Ban's spokesperson Michele Montas is despite the seeming backtrack Ban stands behind the $1 million figure, she said yes. She acknowledged that most of the $1 trillion is money already promised, but noted that Ban is asking for $25 billion on top of pre-existing ODA commitments of $100 billion, and that the rest of the trillion includes, for example, lending by the International Monetary Fund. The Secretary of what's become known as the Stiglitz Commission, appointed by President of the UN General Assembly Miguel d'Escoto Brockman, answered Inner City Press' question to Stiglitz about Ban's $1 trillion idea. He did not address the number, but rather to whom such money should go: directly to lower income countries, he said, and not to intermediaries like the World Bank -- or the UN or UN Development Program. What Stiglitz' views are on providing cash with no conditions to governments like those of Myanmar or North Korea is not known. The IMF has been asked about conditions on a $1.9 billion loan it is negotiating with Sri Lanka, the proceeds of which the government has said may be used for camps for internally displaced people from which the IDPs cannot leave or receive visitors, even from family members: detention camps. Using a percentage of the bailouts to fund interment would give a new meaning to the UN system phrase, "Vulnerability Fund." To be continued. Footnote: several reporters at Stiglitz's March 26 press conference joked afterwards about his lines that he not only predicted the financial meltdown, but also wrote the first academic paper supporting micro-lending. This last claim seems dubious, unless one discounts academics in, for example, Bangladesh. Maybe with whatever turns out to be their share of the requested $1 trillion, Bangladesh can more widely promote its scholars.